Does Jesus make demands of us? If so, what are they? Wherever you are in your spiritual walk with Jesus this book is both challenging and thought provoking. As well as the pdf book, there is also a very useful study guide at the Desiring God website. 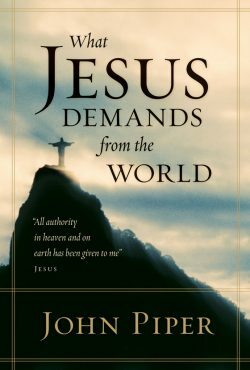 To get the free pdf download of “What Jesus Demands from the World” simply go to the Desiring God website at this link and then select the ‘Read this book online (PDF)’ link. I purchased this book and would want the whole world to read it. We are so lost without Jesus Christ and it sorrows my heart to know people will miss Him in this life and most importantly, the next. Jesus sends His message through the Holy Spirit from time past, He is here in this book telling us to follow Him. Following Him means absolulte submission, love, trust and obedience. Loving Him first means we will do whatever it takes to please Him and recieve His rewards…well, it’s hard to describe the love and peace that rings out of your heart when we obey! He is truly amazing. Your response highlights what it is I love about Piper’s books (and sermons etc.). His focus is all about Jesus and what he has done for us. What a privilege it is to be a Christian, and yet so often we can take it and Jesus for granted. I like this website. God bless. i will be a great help for me if you send me a free copy of that book. Thanks for alerting me to this, I have changed the link to one that works now. I would like to go through this book. As I don’t have the facility to continue to use the desk top it is highly appreciated if you can send me a copy of the same at the earliest. As some above, I am unable to download. Would it be possible to obtain a copy of this book via post? If so, please contact me for a shipping address. Thank you. Please kindly send the book what Jesus demands from the world by John Piper.Could it be posible getting it in Zambia,kindly let me send you my mailing address. HOW CAN I GET A COPY OF THIS BOOK SENT TO ME BY POSTAL MAIL? How I can have a copy?? John piper is one of my favorite Preacher i have heard some of his sermon and i will love to have copy of his books. Be Blessed! I thank God for the resource through your website.. This will be a great help in my preaching and church ministry.. Since i can’t afford to by printed books. so i use this way to equip my ministry..I will so much thankful to God and to all of you if i get books in printed copy. i need this book please how can i get it.